The Teutons are not just known as fearless warriors. During some periods, they also peacefully coexisted with the Romans and ran trading exchanges with them alongside the Danubian limes. Their most treasured good was amber, which the Romans bought for high prices. Now it's your time to profit! 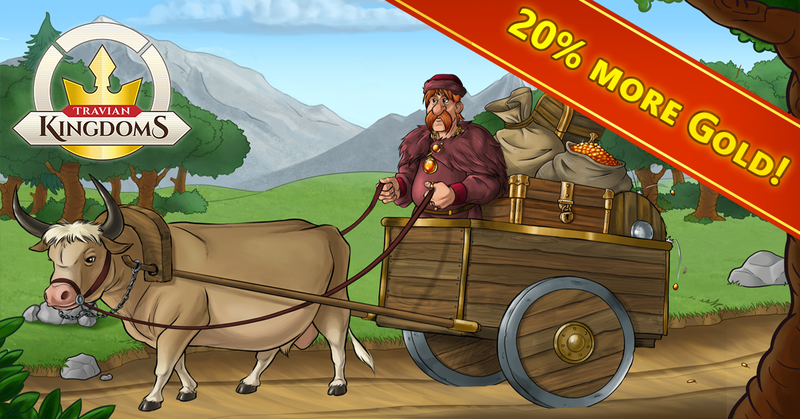 Enjoy this Travian Kingdoms promotion and get 20% more Gold with every purchase between Friday, April 20th starting at 12 pm CEST (noon time) to Monday, April 23rd, until 12 pm CEST (noon time). Note: this bonus does not apply to purchases made via SMS, vouchers, app or by phone.